The man behind the Maverick TwinJet is well into another project. After several of his two-engine jet kitplanes achieved true airspeeds of 350 knots and exhibited superlative handling, Bob Bornhofen sold the company and began to focus on a single-engine jet for the emerging Very Light Jet class that includes such competitors as the Eclipse 500, the Cessna Mustang, the Adam A-700 and the Diamond D-Jet. However, Bornhofen is operating Excel Jet completely different than the others. In this interview with Jerry Lips, publisher of Airport Journals, he explains how and when his Sport-Jet will arrive on the scene. Tell us a little bit about your education and background, how you got here. Bob Bornhofen believes his single-engine jet will find homes in hangars previously occupied by Bonanzas. I graduated from Parks College of Aeronautical Technology in 1966, and then received a master’s in aeronautical engineering a year later. I never really used the aeronautical part until the Maverick project and now this project. After earning my B.S. degree, I went to the University or Arizona to get a master’s. My first job was on the Apollo program and then I worked for 12 years on military satellites. I began to specialize in systems engineering. I left the aerospace industry in 1980 and went on my own. I retired in 1998 when I sold a company I co-founded. However, I just couldn’t get used to being retired so I got involved in building a Seawind kit. That led to my starting the Maverick TwinJet project. Tell us how you came to build the TwinJet? The TwinJet was designed in anticipation of the FJX-2 engine, which was being developed under the General Aviation Propulsion program. The FJX-2 was going to be a new generation turbofan engine producing 700-800 pounds of thrust. When delays occurred for that engine, we elected to use the T58 engines so we wouldn’t slow the TwinJet development. The concept was, “If you build an airplane and make it certifiable–pass all the FAR flight tests, with look-alike engines–then when the FJX-2 engines come along, you’re kind of ahead of everybody else. You have the aerodynamics resolved and performance data behind you. If those work out correctly, the remaining issue would be to simply re-engine the aircraft and start certification. Since we would already have the airframe proven, we would have a significant head start on competition. That was the basic business model. We were also using the Experimental Amateur-Built category to work out any major airframe issues. At that time both Lancair and Cirrus had just received certification on their respective aircraft and both of those graduated from experimental aircraft. We looked around to see what engine would have similar performance characteristics to the FJX-2, and after a few false starts decided on the GE T58. Boat racers were using these engines by converting them from the helicopter turboshaft engine to a crude turbojet engine. While the basic conversion was “proven” to work, no one had made a flight-worthy conversion. That took some creative engineering, for example, to rework the oil distribution system, fuel controller, replacement of the power turbine with an exhaust–all necessary changes. Needless to say, we didn’t get encouragement from the original manufacturer. Our work was quite productive. Mind you, the first iteration was not as efficient as later versions but it got the aircraft into the air. We first flew to Oshkosh in 2000, and then in the middle of 2001, we put the plane through a series of flight tests–all centered on the FAR 23 flight-testing criteria. The resultant report from the pilot was the plane didn’t have any major impediments that would prohibit starting certification. When we designed the Maverick, we did it in two year’s time. We passed all the FAR flight tests within two and a half years from the beginning of the concept, for vastly less investment than what has been spent on other programs. Prior to the flight-testing two things occurred that influenced the anticipated certification of the aircraft. First, Williams decided not to pursue the FJX-2 engine. The second was input from the insurance side of the fence. In pursuing insurance for the aircraft and kit owners, we were advised that for our target market, a single engine would be considered a better solution. That meant we had to go back to the drawing board. An offshore group who had seen the TwinJet and was looking for a single-engine military version of the aircraft contacted me and I started doing some initial design work for them. Meanwhile, a Mr. McCotter wanted to pursue the twin-engine solution, so the aircraft found another life when it was sold in March 2001. McCotter bought the rights to the Maverick? Correct. So, far, three planes have been put in the air. The first prototype was flight tested to about 370 knots during a series of tests to determine if the aircraft had any major certification-related problems. I believe the other two kits have flown about the same. I’ve been told that that one aircraft has been to 350+ knots and the other around 330 knots after only 10 hours of testing. Typical flight cruise was 340 knots at 25,000 feet. More importantly than the speed was the flight handling. We wanted what one might call a Learjet with training wheels, similar to the early Citations. Get rid of all the complexity. Make it easy to fly. Make it real docile. And it was. It handled in a pattern like a Beech Bonanza, Duchess or Piper Seneca. Are those airplanes still flying? From talking with you earlier, it appears your passion is the engineering and making it work and recognizing the market? You kind of independently hit the market way ahead of a lot of other people. You recognized it years ago, right? Did you do the design yourself or how many were involved in the design? I did all of the conceptual design and preliminary specification of major components. For detailed design of wing spar members, major structural members, we have only a few engineers. Did you have a wind-tunnel model for it or have you done just theoretical wind-tunnel work or theoretical aerodynamics? We didn’t do any wind-tunnel models. However, we did tuft the entire left side of the aircraft, the wings and tail. We placed video cameras in three different locations to record the flight results and flew the aircraft in all possible flight configurations. There wasn’t one bit of flow separation. The Sport-Jet follows that concept closely. The wing was changed from constant cord to a slight taper for better support of flutter. The horizontal tail has slight sweep and again, like the wing, is tapered. The inlets were the focus of the majority of engineering attention because turbofan engines require real even airflow across the face of the engine. The biggest issues on this kind of aircraft are the inlets because of the inherent nature of a turbofan engine. Is this because of a high angle of attack? Separation? Not really high angle of attack but more keeping the airflow uniform across the face of the engine. “S” shaped inlets are a challenge and you need that type of inlet when the engine is inside the aft fuselage. Essentially the aircraft was really pretty much designed around the inlets. I moved here in 1970 on a classified military satellite program. I retired from Hughes in 1980, went out on my own, retired from my company in 1997, and then got involved with the Maverick. I started flying in 1990 and eventually got a piston twin license, but I couldn’t rent and fly a twin-engine aircraft until I had a hundred hours with someone in the right-hand seat. Nothing to do with capability; it was the insurance requirement. If you look at the numbers, a piston twin like a Baron is still only flying around 220 knots and not really flying above the weather. To fly a jet aircraft would involve accumulating at least 1,000 hours of flight time. Jet aircraft get to fly above the nasty weather. I thought, “This is a kind of a weird theory.” You have to accumulate all this time in a piston plane flying in the soup. You never really get above the weather. Now when you survive 10 years or 20 years of doing that, then they allow you to fly a jet in nice, clear air. That’s really a good point, Bob. If you build a simple, easy-to-fly airplane that gets above everything, it really is safer than thrashing around down in the clouds and all the extra controls that a propeller-driven airplane has and different opportunities for failure. That makes your Sport-Jet interesting. Well that’s where we started with the Maverick. In addition, we made the aircraft a mid-wing design because we knew that there would be gear-up landings. Is the Sport-Jet a mid wing, too? Yes, we made it a mid wing and made the fuselage very strong. We verified the underwriter’s prediction about gear up landing. A landing incident resulted in the main landing gear being pushed through the wings on impact. The plane then bounced about 200 feet and about the time of the second impact the engines got to full power and the aircraft made a wonderful no landing touch and go. The two pilots flew it to another airport, and did the infamous belly landing. The plane skidded for about half a mile before coming to rest. There was no fuel spill, no wing or wing spar damage, and in three weeks, we were flying again. Total cost to fix the aircraft was around $25,000 and most of that was new landing gear parts. That’s what the aircraft was designed to do, because insurance people know that when you have a gear-up landing or similar kind of incidents there is a good chance you will damage the wing spar. And quite often, once the wing spar gets damaged, the plane tends to be totaled. What customer support structure are you going to use? We’re going to put in place a major customer support structure. We’ll have an inventory and parts warehouse, service and flight training. Right now we’re working on trying to get three or four more aircraft built to use as flight trainers and marketing/demo aircraft. When do you expect to start certification? Bob Bornhofen’s progress seems quick by this writer’s perspective. We’re already on record; we’ve already submitted some of the paperwork. Once we get through the FAR flight tests, we’ll move even faster. We want to make sure the plane has no flight handling anomalies. We have complete FAR 23 documentation on all the major components. The plane uses a standard control wheel and yoke arrangement for the flight controls. All the control surfaces are cable driven. We’re using very traditional technology. I expect the flight test phase to take between three and four months with some certification effort proceeding in parallel. When do you anticipate your first customer delivery? It should be two and a half years from now or two years from completion of flight-testing. The critical component here is to make sure that we don’t have any snafus or major setbacks. Who will be doing your flight test work for you? We’ll use Len Fox. He does all the Lancair flight test work. He flight tests a lot of different planes and does it to all the FAR standards. He puts it through its paces and he’s not afraid to call it the way he sees it. I understand you’re going to have ballistic parachute recovery system on the Sport-Jet? We’re working on a parachute-based system that we’re calling a “supplemental emergency landing system.” We’ve explored a ballistic system similar to what is used on the Cirrus but it won’t meet our objectives. We’re exploring a substantially different way to help a pilot land an aircraft in an emergency. Our goal is to have a system that also salvages the aircraft. At this time, our concept is proprietary but we’ll make announcements as appropriate. Do you have financial backers? As you go through steps, do you have folks that are willing to ante up? Yes. We have a substantial investor coming in four to five months. Is it an individual or a company? It’s a group and they will put in the necessary dollars to support certification. They just want to make sure they’re not buying a pig in a poke. I don’t blame them one bit. When Sport-Jet goes through the FAR flight tests, they’ll ante up with a lot of money. Is it correct that you’ve put your own funds in until this point, and until they come in, it’s 100 percent yours? Yep. This is what it’s about. This separates the men from the boys. There is the OPM saying. The classic meaning is “Other People’s Money.” This is “Own Personal Money.” That’s what we did when I was in the color copier business (when that was a new industry). We did it all on our own nickel. It makes you think differently. It makes you think about how you get things done quicker, less expensive. You’re not extravagant. You don’t go with big marketing campaigns. And it works! You saw the crew here. We had nothing here basically at the end of June 2004. Then parts began arriving. 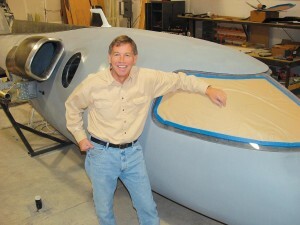 We brought the two fuselage halves from the fiberglass vendor at the end of June. We began working, after the July 4 weekend, to build this aircraft. That’s what we’ve been doing. We’ll have the avionics installed in two weeks. We should have the windows and engine installed in three weeks. It’s going along quickly. We can bypass the interior for this aircraft as it will be the flight test article and we want access to wires and hydraulic lines. We’re currently working on a cabin mockup while developing an interior design. We have looked around at other aircraft and one really has to admire the Cessna Mustang interior. It’s very simple yet very elegant. Will the Sport-Jet interior look like the prototype Mustang? Yes. I saw one. It’s gorgeous interior. It’s beautiful. Cirrus started something with the auto interior concept, their automotive interior look. Those not familiar with aircraft felt very comfortable sitting in what appears to be a car. It was smart psychology and it worked. The Sport-Jet appears to be a fairly short-coupled airplane. Did you do stability analysis? Are you going to have to have any type of pitch augmentation or anything like that? Yes, we did stability analysis. The Sport-Jet’s design is very straightforward and simple. It’s not as short coupled as you might think. The Maverick was shorter coupled, but hasn’t had any problems. This has much longer tail moment arm than the Maverick plus there has been substantial engineering analysis in this area from engineers here in the U.S. as well as Poland. How will you do full ice protection? Are you going to use bleed air deicer, TKS, or have you decided yet? Do you plan to use electric or boots? The deice design is proprietary at the current time because the problem you have with this kind of “S” shaped inlet is not just the inlet lip of an engine mounted on the outside, but the entire internal first bend…what you would see if you looked into the inlet from the front. That also has to be deiced. We’ve already gone through the solution with a deicing company. We have a base solution that’s already been somewhat verified by the FAA that would be acceptable. Whose avionics are you going to use? We’ll use Sagem/ARNAV. ARNAV has been around for a long time; Sagem bought them. They have an excellent “all glass” solution. You’re getting all the displays, cards and everything from them? Yes. The first test aircraft will have a single screen, what they call their composite mode. It combines all the normal PFD data with engine data into a single-screen format. After flight-testing, we will install a complete IFR panel. They have all the necessary controls for pressurization integrated into their MFD along with downlink weather radar, terrain representation and engine data. What are you going to use for backups? The hurdle that most manufacturers have is that unless you have three sets of gyros and electronic displays, you have to have a backup. We’ll have a set of your typical backups. There’s room for that. What engine are you planning to use? We can pick between either the Williams 33 (FJ33) or the Pratt 615. Pratt’s 610 is used for Eclipse where the 615 is the one the Mustang is going to use. When do you expect to fly? We should fly in three to four months. The wings won’t be here until probably the end of December now. Are you going to have a FADEC or supervisory control or are you just going hydro-mechanical? We’ll use hydro-mechanical on the T58. We expect to get sufficient thrust to verify all the flight control parameters, stability and flutter; if there are any engineering problems with the inlets, I’d rather work those out with a $50,000 T58 engine than possibly damage a $300,000 engine. Who’s doing your windows and windshields? People in California who do all the Lancair windows are making ours. I noticed you’re going to 25,000 feet. Are you going to have any pressurization in the airplane, or is that just on oxygen? This first aircraft will not be pressurized but all subsequent aircraft will be. Are you going to try to bump it up a little above 25,000 at that point, or is that pretty much it? Working with our insurance representatives and looking at the FAR requirements, we’ve decided on 25,000 feet. Obviously below FL250, things are just a lot simpler. There are fewer issues to worry about. More importantly, we have designed this plane for the 600-700 nm missions. From over 400 hours of prior flight test data (on the TwinJet) we feel this is the best solution and fastest trip time. Our goal is to have a plane that a single pilot can easily fly and have a 600-mile total trip time of two hours. What sort of pilots are you targeting? We’re trying to aim for the guy who can fly a TBM 700 or Beech Bonanza, Beech Baron, Piper Meridian and similar aircraft. You designed to be able to take full fuel, full passengers? Right. We figured occupants at 180 pounds plus another 30 pounds of bags per occupant. Do you have electric gear on it or hydraulic gear? We use what is termed electro-hydraulic. An electrically driven hydraulic pump is used to raise and lower the gear. The gear is held up via hydraulic pressure so if there is a hydraulic failure, the gear free falls and locks in place. Which pressurization system do you use? Do you plan to use a clamshell door? Yes, this was a blend of the door designs from the Learjet and Cessna’s 340. We modified the size of the upper/lower doors to fit the interior trim of the aircraft. Sport-Jet has a lot of room inside. It is a roomy cabin. How about headroom? Sport-Jet has 48 inches from floor to the top. What’s your target price on the airplane? We expect to charge approximately $1.0-1.1 million. Keep in mind that the engine and avionics are going to cost about $360,000 alone so that does not leave lots of pricing room for airframe, interior, marketing and sales. To sell at that price, what production rate do you have to maintain? It can work while producing about 30 aircraft a year. We believe the market for this type of aircraft is larger than 30 per year. How do you plan on marketing it? We’re probably going to start a marketing program here the first of next year. The best way to market it, in our opinion, is to do flight demonstrations, at events like the Airport Journals jet shows. People have to see it. They have to fly it or to see what it flies like. So you’re going to take the Sport-Jet from Florida to California to all the big GA airports where Airport Journal holds the Business Aircraft & Jet Previews, and actually demonstrate this right to the people? Sure. If they sit in it, they get a feel for the space. They fly it and get a feel for how it flies. When we did the Maverick, people were amazed at the acceleration the aircraft had. During takeoff, if you weren’t quick, by the time the gear got sucked up, you were going through 140 knots. By the time you got past the end of the runway, you were going through 180 knots. We would typically climb out at 210 knots and cruise around 340 knots. You’re filling a new niche. Correct, we’re filling a completely a new niche. The Cessnas and the Beeches, Raytheons and everybody else is looking for a niche that nobody has filled. It’s interesting. Cessna, did the 182, went to the Caravan and then the CJ1. You go up, but you find a big block of no airplanes between a Caravan and a CJ1; there’s nothing in the price range. The Mustang’s lower than the CJ’s price, but you still have a gap between a million-dollar airplane and a two-and-a-half-million-dollar airplane. Sport-Jet will come in at a million plus change. And it would theoretically outperform some of the multimillion-dollar airplanes that are out there right now. I think that’s significant. We’re trying to define a whole new niche. A book called “The 22 Immutable Laws of Marketing” says, “It’s better to be number one in a new niche than number two or three in an established niche.” The Maverick was a new niche. It was four-place. It was 350 knots, true. What other kind of airplane about that size goes that fast? No one. Cessna flew about 350 true, 270 knots indicated on the CJs, right? Okay. We were flying the Maverick at 240 knots indicated–only 20 knots slower. Where are you in the production process? Who’s preparing all your tooling? We are. The aircraft cabin is all composite with aluminum wings and aft fuselage/tail. The tail and all the wing parts are fully supported with production tooling, FAR 23 analysis and reports, and are ready for certification submittal pending flight tests. We have developed production tooling for all the aluminum members and we have tooling for the major fuselage parts. 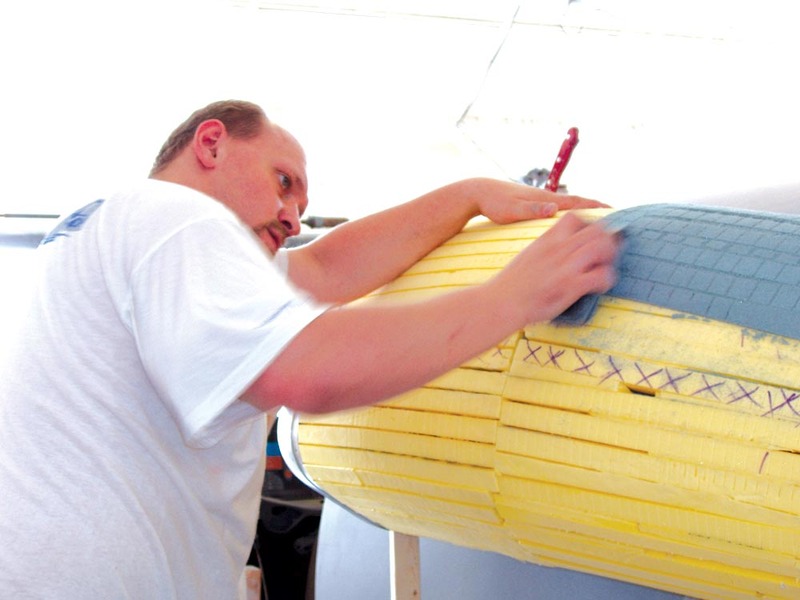 We have fiberglass tooling for some of the major fuselage parts like the doors, but that tooling is soft right now because things will change, as you know, between drawing board, prototype and what really happens. We did all the fiberglass tooling here; I understand fiberglass pretty well. In building the aluminum tooling and parts, we have 50 to 60 workers in Poland doing detailed parts engineering, tooling manufacturing and assembly. Here’s some of the wing spar tooling and some of the tooling for the tail. The whole idea behind this aircraft was to take the prior knowledge learned in the TwinJet and address (1) the insurance issues (single-engine) and (2) certification issues. Aluminum wings, as you know, have a lot of history behind them. The aluminum tail was chosen because we felt it would better support the certification requirements of engine fire, rotor burst and similar concerns. Carbon fiber or composite works very well when you have compound curves on a fuselage. So we have a plane similar to the Beech Premier 1, that is, a carbon fiber cabin with aluminum flight surfaces. Our carbon fiber fuselage could be considered a light composite skin superimposed on a carbon fiber roll cage. The fuselage has several solid circular carbon bands that go around the cabin with several solid carbon longitudinal stiffeners that interconnect the circular bands. I like what you’ve done with the cabin. That cross section is outstanding. We learned that with the Maverick. It was a wide cabin. Isn’t this quite a bit bigger than the Maverick? The Maverick cabin was more of an oval. All I did for the Sport-Jet design was basically draw a circle around a view of the Maverick cross section. So the fuselage is more rounded? Yes, so it’s easier to pressurize. We’ve had this shape up to 7 psi already on this one, but it gives you three inches more in the side and over your elbows, and it gives you three inches more as you walk down the middle to get to the seat. How does this compare to the Eclipse 500 in interior size? And more room for the pilot and right-seat occupant? Oh yes, significantly more room up front. As a way to explain the concept, how would you summarize the Sport-Jet, as far as design, ease of use and meeting customer needs? The small USA team works closely with second team in Poland. So the question is what to build that allows these pilots to fly a jet aircraft with the least amount of difficulty. 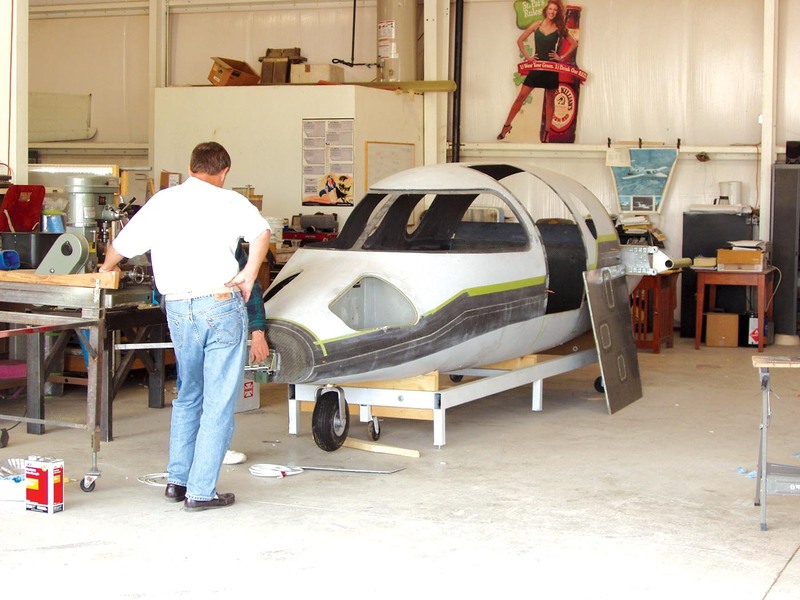 Is there anything you as an aircraft builder can do that makes the training easier, gives the insurance underwriters a warm cozy feeling that this lower-time pilot isn’t going to be a statistic or if he is, then is there a way to mitigate the repair bill? And you have to consider who your market is. So you’re really focused on what the customer wants? Yes, I believe you have to ask what the customer wants and doesn’t want. He doesn’t want to be cramped. He likes to fly in something that’s the equivalent to a Citation or CJ, because they’re comfortable planes. He wants to have digital avionics. He wants the turbine. He wants good speed. And he wants to be able to get into it without a lot of hassles. We came up with a single-engine design. It still has good performance and substantially less fuel burn. We’re able to cruise at 340 knots. That’s faster than a lot of people are flying in their twins. And, we’ve already demonstrated what we can do with the Maverick TwinJet. I may be speaking for others when I express a personal prejudice about the single engine versus multiengine. I understand you have to do that to hold the cost down. Statistically speaking, a single engine is going to fail at some point, and you don’t know if it will be at the very first flight hour or at the 100,000th flight hour. That’s why your (emergency parachute) recovery system, slow stall speed or whatever is able to get the airplane down becomes so critical to me. We also have to keep the cost around $1 million. That’s important to stress. That choice takes your Sport-Jet from a million-five airplane down to a million-dollar airplane. You have $600K, almost $700K of cost by the time you buy two engines and avionics. Every pound you add for the engine, you have to add another pound to the airplane. It exponentially spirals up. I think that’s going to be an interesting piece on your sales when you get into it. We want to keep the weight around 4,400 pounds. For Europe, an aircraft of this weight does not pay over-flight taxes. When the second engine is added, the gross weight increases by at least 1,100 pounds. That is simply the weight of the engine increases in aircraft structural weight to support the engine and the fuel it will consume. Also, a second engine doesn’t necessarily mean the plane is going to fly faster. Would it be safe to say there’s no financial planning or anticipation of your airplane in the air-taxi market? You don’t anticipate that being your market? Correct. We’ve been in constant contact with an insurance-related group. They’ve been following–and advising–during the entire development. From the onset, this plane has been designed for the owner operator, not air taxi. With what aircraft does this airplane compete? That’s a good question. Look at the Eclipse, for example. They’re about a 370-knot aircraft, but at 41,000 feet. You back that down to indicated airspeed and you’re at about 190 knots. So, at 25,000 feet, they’re about 290 knots, 300 knots. Sport-Jet is faster. Eclipse may be a while coming to market. If someone was going to go out and buy an airplane, they’re looking at X airplane or maybe yours, who’s going to be the more direct competitor to you in the near future? It’s a different audience. A good analogy can be seen in the computer field. You had the mini computers and then you had PC computers. Then you had a thing called a Sun Workstation, the size of a PC, but a lot faster. This is kind of like the Sun Workstation. It cruises almost the same speed as the early Citations did, so you have the speed. You don’t have to get up high to get to that speed. True, you have a smaller cabin, but then not everyone needs a six-place aircraft for only three people. So, as it turns out, there isn’t anything that directly competes with us. I think that if we can bring the Sport-Jet to market for a similar amount of money as the Meridian and others, then it will be a success. The only way I know to do that is to do it in a skunkworks type of organization on the first flyable aircraft, get it through the testing and then put a whole lot more money in tooling and certification. What you said is right; you’re a visionary–the Kelly Johnson school of thought. You bring things to market and ultimately pass the design on to a more traditional manufacturing and production. And we’ll have the same organization responsible for the major flight-critical components–such as the wings, tail, aft fuselage, inlets and so on–perform the certification of that component. Since they were involved in those critical designs, tooling and manufacturing–all produced in accordance with FAR 23 guidelines–they have an excellent start on the certification task. If you just summarized in a few words, what have you done with Sport-Jet? What I hear you saying is, “This is a good design, and you’re intelligent enough to make it work.” I think having a strong leader with a strong vision, and if you can in fact bring it in as inexpensively as you believe you can and with the partners you have, and doing everything else that you do, then you have a very reasonable shot. For more information, contact Excel Jet Ltd., Robert Bornhofen, by email at sportjet@earthlink.net or at 719-495-7221, or visit [http://www.sport-jet.com/]. Most parts are made in Poland and assembled in the U.S.